First up on the list – Chinatown. This place is really jam-packed with places that will be perfect for your #OOTD shots. Whether it is the tourist favourite Buddha Tooth Relic Temple And Museum, or along the quaint old alleys like Smith Street, there is something for you. Psst, while you’re there, you can even check out the Shopee x Chinatown CNY Bazaar that’s happening at Smith Street. Play old school games like our Shopee Tikam Board or try your luck at our Shopee Huat Chamber, and you might see the god of fortune shining upon you as you walk away with vouchers and exciting prizes! The various art installations at the ArtScience Museum will also illuminate any outfit you’re wearing. Visit the Crystal Universe for an out-of-this-world photo or the Future World: Where Art Meets Science exhibition for a colourful, delightful backdrop. Usher in the new year with Gardens By The Bay’s Dahlia Dreams, the newest installation that will be happening only from 18 Jan to 24 Feb. Or perhaps visit the magnificent Supertree Grove and the tallest man-made waterfall that will serve as the perfect #ootd spots. The vibrant colours of the flowers will surely bring out everything you’re wearing. If you’re looking for something similar to Gardens By The Bay sans the crowd, the Singapore Botanic Gardens might be your next best bet! The lush greenery around the park will serve at the perfect backdrop for your outfit (especially if you’re wearing red). Of course, do remember to arm yourself with a bottle of mosquito repellent because you won’t want to suffer from mosquito bites. are you, or am i? With hip eateries and picturesque alleys painted with charming murals, the Tiong Bahru estate is not only one of the best #ootd spots in Singapore but also photography spot for any budding photographer. Strike a pose in front of the shop or along any of the alleys, or perhaps in front of any of the murals for the perfect #ootd shot. Of course, since it’s Chinese New Year, you’d definitely have to visit the Chinese and Japanese Gardens for the extra feels~ Built in 1975, the Chinese Gardens was modelled after the northern Chinese imperial style of architecture and landscaping. Adjacent to it is the Japanese Gardens, which was modelled to showcase a landscape style originating from the Muromachi and Momoyama periods of Japanese history. Snap a shot in from of the Seven-storey Pagoda or simply strike a pose at any of the many bridges for the perfect #ootd shot. The colourful and vibrant storefronts, shophouses and muraled walls of Haji Lane are really one of the best #ootd spots in town. Strike a pose with the wall in the background or simply in the middle of the alley for the most IG-worthy shot. 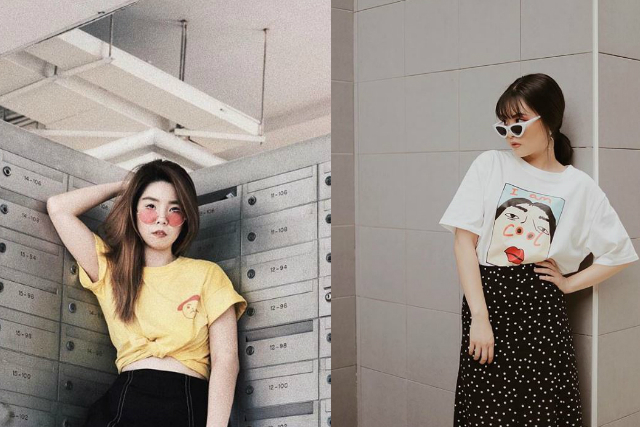 A well-known contemporary art cluster in Singapore, Gilman Barracks is filled with art installations and even buildings that can serve as the perfect #ootd spot. Our favourite has to be the giant pineapple installation. Of course, this spot is also great because Creamier has an outlet right there, and who would say no to a serving of delicious ice cream waffles?! Outside or inside, the National Gallery Singapore has much to offer in terms of #ootd spots. As with all museums, the building is filled with exhibitions and empty spaces with details that can serve to supplement your outfit. Also known as the Ministry of Communications & Information (MCI) Building, this colourful looking shophouse is actually, in fact, a government office. You might think it’s another museum (given the fact that it is in fact, near popular tourist attractions like the Singapore Art Museum, Peranakan Museum and more), but it’s not. Pose outside the colourful windows or in the middle of the road (watch out for traffic though), for the perfect shot that can accentuate your #ootd. The library@orchard is unlike any other public libraries. Launched in 2014, this library is centred on lifestyle, design and the applied arts. Pose along the aisles and get your friend/boyfriend/girlfriend/photographer to take a shot of you from above for an excellent effect. Alternatively, you can hunt for the white and brown ladder and climb on it for the best IG-worthy shot. Move over Tiong Bahru (or Haji Lane) because the alleys, traditional shop houses and cafes along Joo Chiat Road is the newest kid on the block. Psst, it’s better to explore these lesser known streets and shophouses before they become too crowded! Of course, not forgetting our trusty ol’ void decks, playgrounds, carparks, or any public space around housing estates. These backdrops also serve as the best #ootd spots in Singapore because of the minimalist details and obviously, the convenience it brings. * TNC Applies. Valid for new users from 1 to 8 Feb only. Previous article12 things you missed from Shopee Indonesia’s very own Asian Games. Beware of major FOMO!